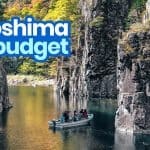 Planning a trip to Hiroshima? 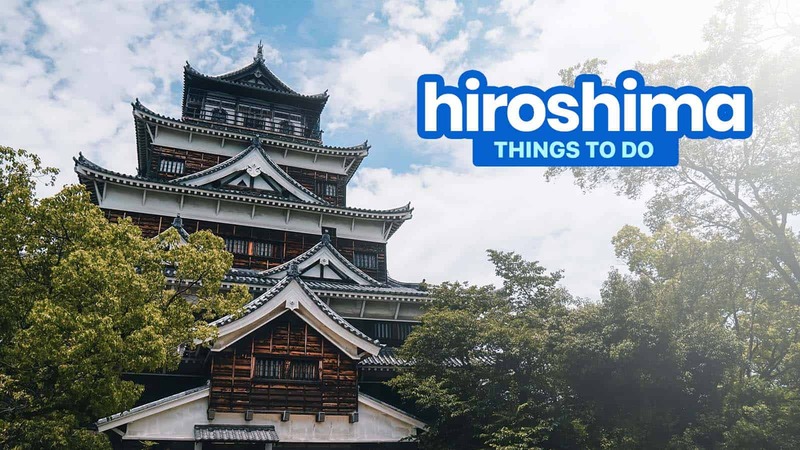 Here are some of the best tourist attractions to visit and things to do to add to your HIROSHIMA ITINERARY! 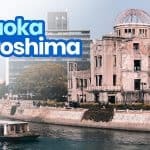 For more information, you can read our comprehensive HIROSHIMA TRAVEL GUIDE! The Hiroshima today is extremely different from the Hiroshima that history books had painted in our collective minds — a forlorn war-torn city, crippled by the explosion of the atomic bomb. Today, the city rises with modern infrastructures and flourishes with commercial establishments downtown. The busy Hiroshima Station connects the city to other destinations within and outside the prefecture. The station is also the usual jumping-off point to most attractions. Many bus companies stop at Hiroshima Bus Center, making attractions outside the city conveniently accessible. 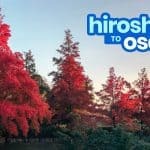 If you are planning to visit Japan and want to make a stop in Hiroshima, here are some of the attractions that make Hiroshima Prefecture a unique and compelling choice for your next trip! The park is set at the area near the center of the atomic bombing during the latter part of World War II in 1945. Aside from being a prime residential area, this used to be part of the merchant district of Nakajima, which was the center of commerce, politics, and military activities back then; consequently, it became one of the targets of the nuclear attack. Emerging from the ashes, the park currently serves as a reminder of the effects of war, especially the use of the nuclear weapon, educating people about the importance of striving for peace instead of division. The park has numerous monuments, memorials, museums, and conference venues; each of them was built not without thinking all those who suffered in the past. Hiroshima Peace Memorial Museum. One of the most notable structures in the park. The museum has two buildings, focusing on the events leading to the atomic bombing on the 6th of August in 1945 and its aftermath. The displays, which include war memorabilia and graphic photos, seek to educate people about the effects of the atomic bomb and to advocate the end of using nuclear weapons. Note: One of the two buildings is undergoing renovation when we visited early this year. It is said to be completed early 2019. The entire museum will be closed from December 29 to January 1. Operation Hours: 8:30AM – 6:00PM (until 7PM in August and 5PM from December to February); will stop admitting visitors 30 minutes before closing time. A-Bomb Dome. Before the bombing, this used to be the Prefectural Industrial Promotion Hall, a fancy and prominent European-style building in the center of the then flourishing city. 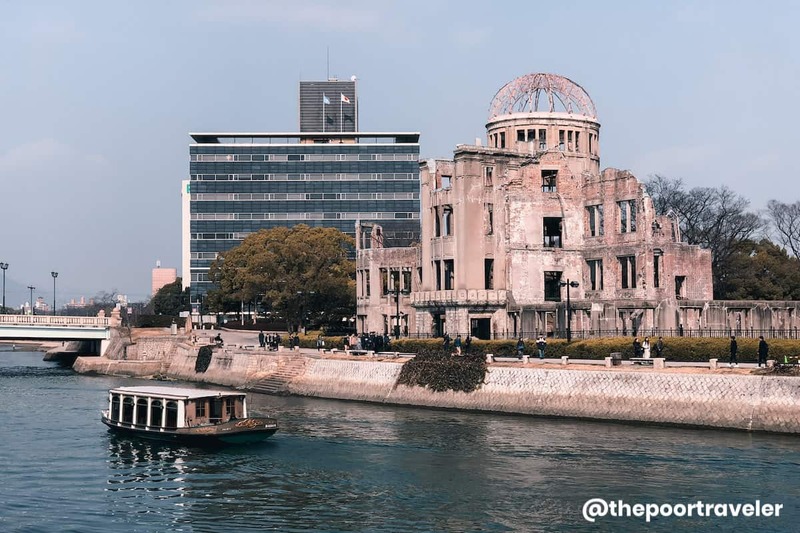 Presently, it is recognized by UNESCO as a World Heritage Site; it is one of the few remaining structures, located near the hypocenter, that had withstood the impact of the atomic bombing. Other structures within the park are the Children’s Peace Monument, the Cenotaph for the A-Bomb Victims, the Cenotaph for Korean Victims, the Flame of Peace, the Rest House, the Peace Bell, the Gates of Peace, the Memorial Tower to the Mobilized Students, the hypocenter plaque, the Atomic Bomb Memorial Mound, the Hiroshima International Conference Center, and the Hiroshima National Peace Memorial Hall. Hiroshima Peace Memorial Ceremony happens on the 6th of August every year. It is held in the park, particularly in front of the Cenotaph for the A-Bomb Victims. This is to remember those who perished by the bombing and to pray for lasting peace. The ceremony starts at exactly 8:15 AM, the time when the bomb exploded. In the evening, a lantern ceremony is held along the Motoyasu River. HOW TO GET THERE: From JR Hiroshima Station, take either Tram 2 or Tram 6 to Genbaku-Domu Mae Station (A-Bomb Dome Station). Travel time: approximately 15 minutes. Fare: ¥180. Before the city came to be, there was this castle called the “Carp Castle”. It used to be the home of the feudal lords, the center of political power in the area. Most castles in Japan are perched atop a hill or a higher ground, but this was built on a plain in the 1590s. Like the rest of the city, it was reduced to ruins when the atomic bomb dropped in 1945. Today, the castle grounds offer the best spots for cherry blossom viewing parties. Inside the castle building are relics and documents that tell the history of the castle and the city. Some of the original materials, like the concrete foundations, still stand even after the reconstruction in the 1950s. The top floors of the five-story structure offer fantastic views of the city. The castle was a government-designated National Treasure. It is nestled inside Chuo Park, which also houses the Hiroshima Museum of Art, the Hiroshima Children’s Museum, and the Gokoku Shrine. You can also do a sightseeing boat tour where you can see different views of the castle. The boat will cruise around the moat surrounding the castle. Ride duration is about 35 minutes. This activity has three schedules — morning, mid-afternoon, and late afternoon. The ticket and reservation booth is located near the entrance gate to the castle’s Second Compound. Admission fee is ¥1,400 (adult), ¥700 (student), and ¥350 (children). Note: During winter, the operation is limited to Saturdays, Sundays, and National Holidays (December-February). Weekday boat during the winter season is only available by reservation. Visit the official website for the reservation here. Admission Fee: FREE except for the ‘Main Keep’ which collects ¥370. Operation Hours: Main Keep (9AM – 6PM, March – November; 9AM -5PM, December – February); will stop admitting visitors 30 minutes before closing time. Note: Closed on December 29 to 31. Nearest Station: Kamiyacho-nishi or Kamiyacho-higashi tram stop. From JR Hiroshima Station, take the tram (Tram 1, 2, 6) and alight at Kamiyacho-nishi/Kamiyacho-higashi stop. From here, take a 10-minute walk to the castle ground. The travel time is approximately 20 minutes (tram and walking). The fare for the tram ride is ¥180. Note: If you are coming from the Peace Park or Shukkeien, you can reach the castle on foot (10-15 minutes). Japan trips are not complete without trying the food. Each prefecture (or city/town) has its own specialty; most, if not all, boast their own take on usual Japanese dishes; yep, even the most staple food has different versions per location, making them a must-try if you are visiting a certain prefecture, town or city. Hiroshima Okonomiyaki. It’s a tasty pancake usually made of egg, cabbage, bean sprouts, meat, and noodles. 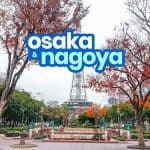 In Japan, there are two famous types: Osaka okonomiyaki and Hiroshima okonomiyaki. Unlike Osaka’s okonomiyaki, which has all the ingredients mixed with the batter already before cooking (sans the noodles), Hiroshima’s okonomiyaki is cooked layer by layer, meaning the ingredients are added and mixed with the batter while cooking. It is then topped with another layer of egg and a generous amount of thicker than usual okonomiyaki sauce. You will never have a hard time finding good okonomiyaki restaurants as the city is said to have the most in Japan. It has been part of the city’s culture and history, helping the people get through the day when the city experienced food shortage after the bombing in 1945. 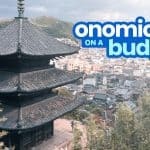 You might want to visit Okonomi-mura (Okonomiyaki Village), a one-stop place for your okonomiyaki craving. Hiroshima oysters. The prefecture is also one of the largest producers of oyster in Japan. Hiroshima oysters abound from the month of October to March, but the best season is between January and February. 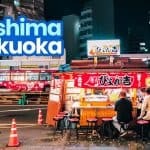 Just like okonomiyaki, you can easily find a good oyster place anywhere in Hiroshima, even within short radius of Hiroshima Station and Hiroshima Airport! 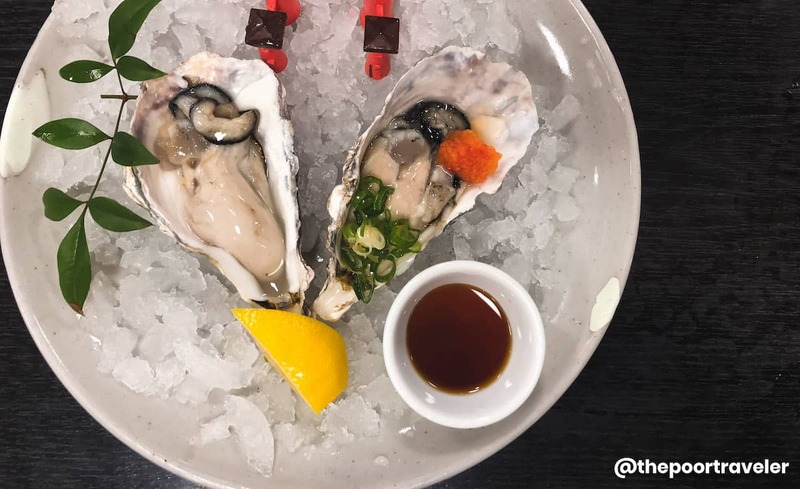 Aside from the city, Miyajima offers mouthwatering oysters without breaking the bank. We tried raw, grilled, steamed, and fried oysters in Miyajima. You might want to try the oyster okonomiyaki if you like both. Hiroshima ramen. Of course, there’s Hiroshima’s version of ramen. It is on the spicy and thin side, mostly using soy sauce and pork bone broth. Apart from the usual soupy ramen, Hiroshima has the “shirunashi tantanmen” or the soupless dan dan noodles. Instead of broth, it normally has chili oil, fried ground pork sauce, and pepper (many of them use Szechuan pepper) mixed together with thin straight noodles. 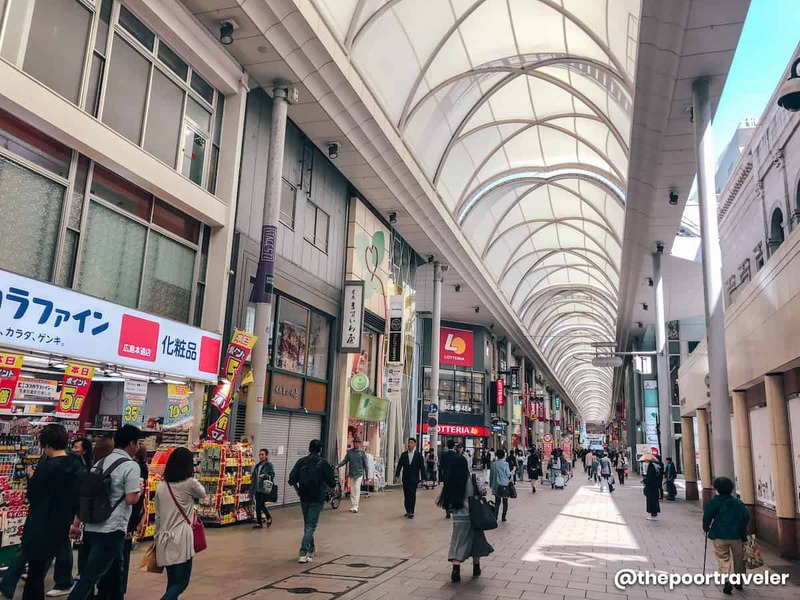 Almost every major city in Japan has their own covered shopping arcade, and Hiroshima is no exception. In Hiroshima, that place is Hondori, a pedestrian-only shopping street flanked by several stores from the usual global brands like H&M to local labels. You’ll find apparel, jewelry, gadgets, and souvenirs. If you get hungry, dine in one of the cafes and restaurants including a branch of Fukuoka-rooted Ichiran Ramen and a local Hiroshima okonomiyaki favorite Okonomi-mura. How to get there: From Hiroshima Streetcar Station, take the Tram 1 bound for Hiroshima Port and get off at Hiroden Station. Fare: ¥180. 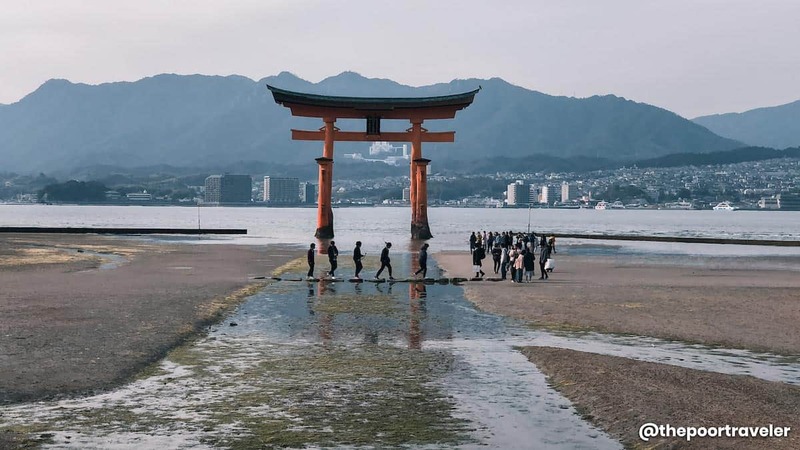 Another UNESCO-listed World Heritage Site attraction near Hiroshima City is the Itsukushima Shrine complex in Itsukushima Island, fondly called Miyajima, meaning “shrine island” in Japanese. 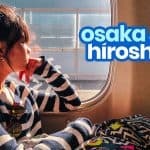 The island is easily reached from downtown Hiroshima, more or less an hour travel time, depending on your choice of transportation — local train (faster) or tram (cheaper). The most prominent structure is the huge torii gate welcoming visitors even from afar. During high tide, the gate seems to be floating on water. The sight is considered one of the three best views in Japan. Aside from Itsukushima Shrine and torii gate, the island boasts various government-declared National Treasures. The island is best experienced when you spend the night there, seeing a different side of this usually busy world-famous site. By local train: From JR Hiroshima Station, take a train on the JR Sanyo Line to Miyajimaguchi Station. From there, take a short walk to the ferry pier (either JR ferry or Matsudai). 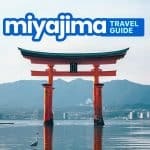 Purchase ticket to Miyajima Island. Board the ferry. By tram: From downtown Hiroshima, take Tram 2 to Miyajimaguchi Station. From there, take a short walk to the ferry pier (either JR ferry or Matsudai). Purchase ticket to Miyajima Island. Board the ferry. By direct boat: From Hiroshima Peace Memorial Park or Hiroshima Port, board a boat to Miyajima Island. Onomichi is just an hour away from the city. Located along the Seto Inland Sea, it is linked to the neighboring islands by the Nishiseto Expressway, most popularly known as Shimanami Kaido. The city is best explored on foot or by riding a bicycle. The trails and the roads are scenic, especially when traversing the Shimanami Kaido. It prides itself of a number of monuments and age-old temples and shrines. Many of Japan’s famous authors and poets have called Onomichi home at least one point in their lives. 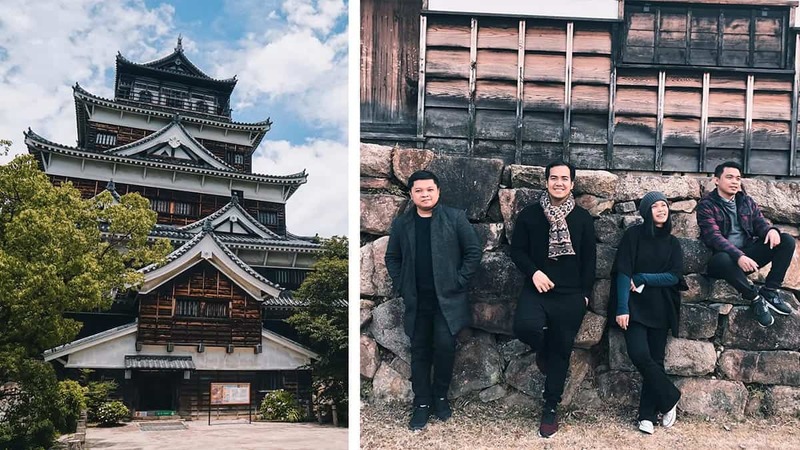 Some of the attractions aside from the Shimanami Kaido are the Temple Walk route, the Hirayama Museum, Onomichi City Museum of Art, and the Kosanji Temple. The city has a fascinating affinity with cats. 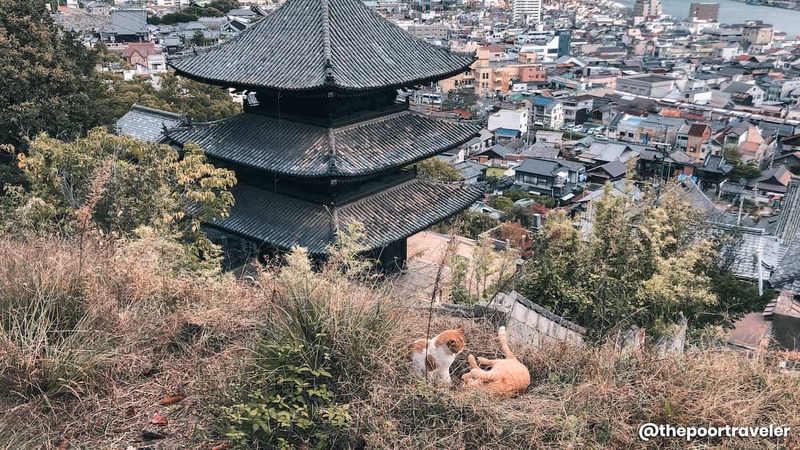 Part of the temple walk is Cat Alley, so-called for the number of cat cafes, cat museums, and cat decors along the trail. Of course, there are a lot of real cats that roam the area. By train: From JR Hiroshima Station, take the train on JR Sanyo Line to Onomichi Station. There are direct trains, but some would involve a transfer usually at Itozaki or Mihara Station. By highway bus: From Hiroshima Bus Center, board a bus to Onomichi. Alight at Onomichi Station. Saijō is a town located in Higashihiroshima, 40 minutes from Hiroshima City. It is famous for sake or Japanese rice wine. Saijo is often called “Sake Town” by tourists and touted as the “Sake Capital of Japan” by local officials because of its numerous sake breweries. 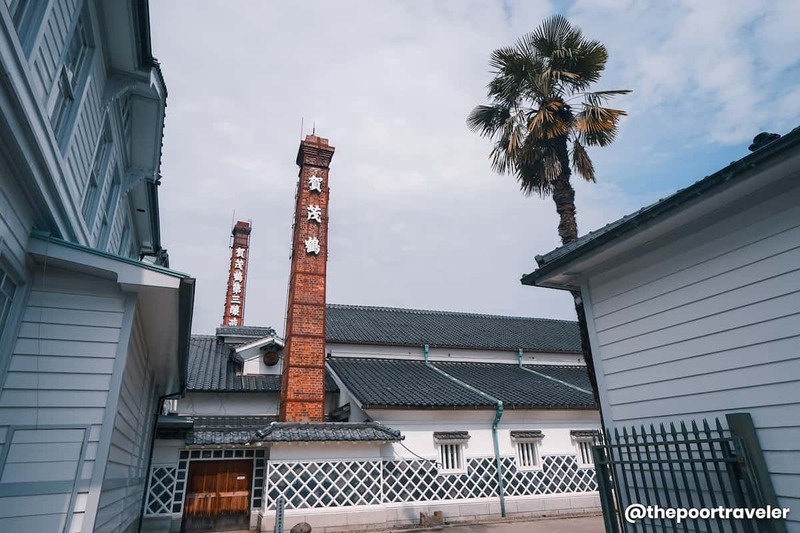 Not too far from the JR Saijo Station is Sakagura-dori (Sake Storehouse Road), which is flanked by 10 of the country’s most revered sake breweries, housed in historic and picturesque buildings. These are: Kamotsuru, Fukubijin, Kamoizumi, Kirei, Saijotsuru, Hakubotan, Sanyotsuru, Kamoki, Sakurafubuki, and Chiyonoharu. You can have a tour of eight or nine of these breweries! Just drop by the Saijo Tourism Office just across the ticket counters at Saijo Station. According to the tourism officer when we visited, the guided Sake tour happens Tuesdays-Sundays at 10am. The tour is FREE from Saturday-Sunday, but costs ¥500 from Tuesday-Friday. You can also tour DIY-style. Make a stop first at the Tourism Office and grab brochures that you can use as guide. It has a suggested route and more info about each stop. From there, you can do your sake storehouse hopping! As you walk around, you’ll learn more about sake and Saijo’s sake tradition, and taste sake along the way. If your trip falls in October, you might want to check out the Saijō Sake Matsuri or Sake Festival! It happens on one weekend in October, but the dates change per year, so check first. HOW TO GET TO SAIJO: From Hiroshima Station, take the JR Sanyo Line to JR Saijō Station. Travel time: 37-40 minutes. Fare: ¥580. 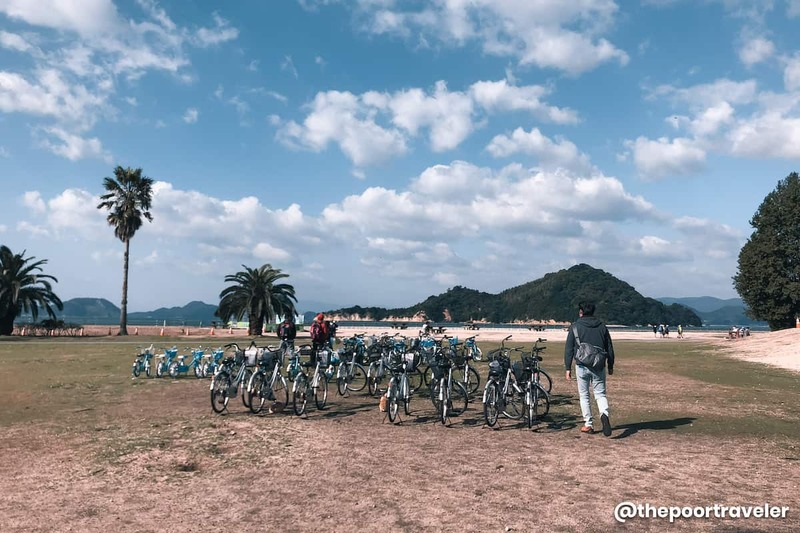 Nicknamed the “Rabbit Island” (Usagi Shima), this island in the Seto Inland Sea under the jurisdiction of the city of Takehara is another day trip destination from Hiroshima city. It will take you about three hours to explore the entire island. Trails are present around and into the island; just follow the directional signage and warning signs. There are many rabbits but you don’t have to worry about being swarmed by them. They are feral, but most of them have no problem approaching people. During World War II, the island was a factory of chemical weapons. It is said that they tested the chemicals on rabbits. After the war, these rabbits were all removed. The rabbits you see today are completely different and were only introduced to the island in recent times. But parts of the island’s dark history is presented at the Poison Gas Museum, which you can enter. If you are into abandoned places and structures, the island provides plenty of buildings in ruins. A lot of forts had been erected to protect the area during the Sino-Japanese War, but all of these were never used. They were left abandoned; the same fate befell the parts of the poison gas manufacturing plant that were built on different areas of the island. There are a few establishments on the island — the museum, a hotel and a couple of restaurants. From JR Hiroshima Station, take the Kodama train on the Sanyo Shinkansen Line to Mihara Station. From Mihara Station, transfer to a train on JR Kure Line to Tadanoumi Station. From there, take a short walk to the port/ferry terminal. Purchase a ticket and board the ferry to Okunoshima. Reminder: Operation between Mihara and Kure was halted last July. It will resume in January 2019. Alternatively, you can take the bus from Mihara Station to Tadanoumi or the Kaguyahime Highway Bus from Hiroshima Bus Center to Tadanoumi Station. Sandankyo Gorge is located in the town of Akiota, more than an hour away from Hiroshima City. 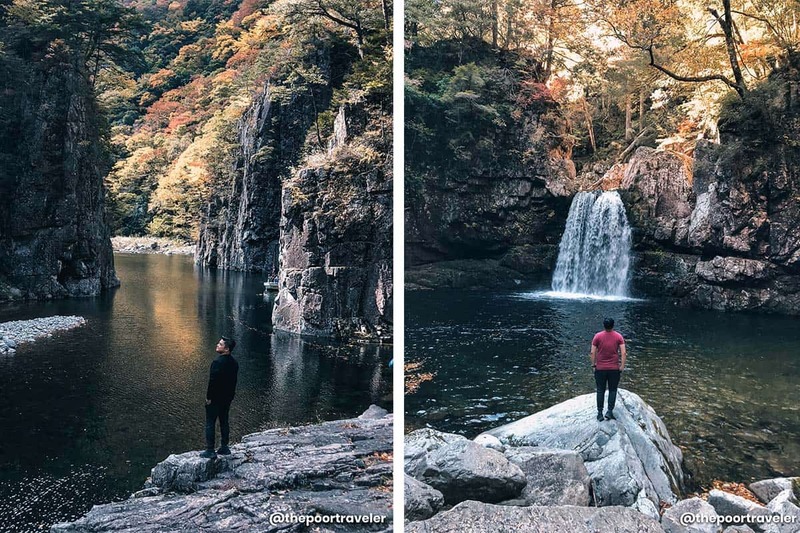 It’s a long ravine meandering through the mountains of Hiroshima, offering a spectacular view for those who love nature tripping and trekking. The attractions are the pools (Kurofuchi) and the waterfalls, particularly the multi-tiered falls. The trail takes around 5 hours, depending on your pace. There’s also a restaurant half-way, offering delicious, grilled freshly-caught fish. The Sandankyo experience is closed during the winter season. The best time to go is from April (spring) to November (autumn); the place is closed when the weather is not good, so it’s better to check first before going during the rainy season. From Hiroshima Bus Center, board the morning bus at Platform No. 7 going to Sandan-kyo Bus Stop. Note: There is only one rapid bus traveling directly to Sandan-kyo Bus Stop in the morning. Featured image by Vins Carlos. All other photos by Yoshke Dimen.